When situations demand split-second target acquisition and maximum field of view, mount up the StrikeFire II and shoot - both eyes open. Feature-rich, versatile and reliable, the StrikeFire II is a great choice for shooters who want a quality red dot sight, but don't want to break the bank. Features sleek rear-facing controls for power on/off and easy adjustment of ten dot intensity levels - lowest two settings are night-vision compatible. Automatically returns to the last dot intensity used when powered up. The 30mm aluminum alloy chassis provides extra-high recoil rating and is waterproof and fogproof. Strike fast! Adjustable Dot Intensity - Provides ten variable illumination settings - the lowest two settings are night-vision compatible. 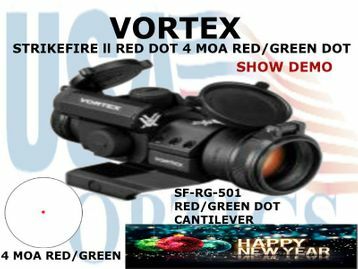 RED/GREEN DOT - The 4 MOA red/green dot is ideal for situations that demand split-second target acquisition. Choose among ten variable illumination settings - the lowest two settings are night-vision compatible.